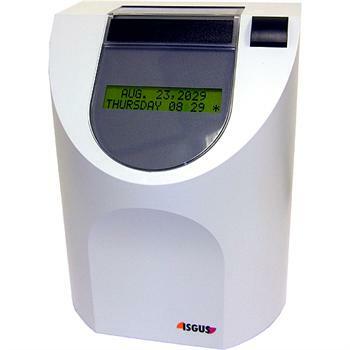 The Isgus 2040 time clock is an easy-to-use calculating time recorder that comes standard with 100 employee capacity. The 2040 can handle virtually any pay period allowing over 100 In / Out punches per time card and can handle even the most extensive configuration requirements. The Isgus 2040 can help eliminate costly mistakes that come as a result of adding up time cards manually and can also reduce non-productive time spent every week doing so. The 2040 time attendance clock will provide you with time card totals that reflect your workplace rules. Isgus time attendance clocks are PERFECT for employers that want to institute strict shift pay policies with regard to their employees' shift start and end times. The 2040 Automatic Totaling Time Clock has multiple revision zones and may be easily set so that employees are not paid for coming in early or leaving late. Isgus offers a one-year manufacturer's limited warranty Warranty does not include consumable parts. With few exceptions, all are return to depot for service. User must pay for shipping to depot. Repaired products will be returned with shipping charges prepaid.